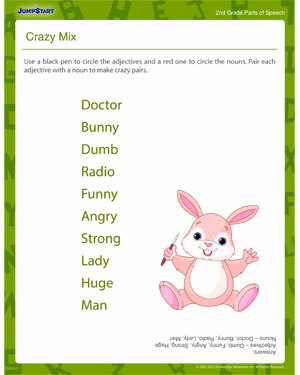 ‘Crazy Mix’ is a fun and engaging parts of speech worksheet that helps second graders brush up their knowledge of nouns and adjectives. This 2nd grade grammar worksheet for kids encourages them to spot nouns and adjectives from a cluster of words and is thus, a fun way to practice parts of speech. Once they have spotted and marked the nouns and adjectives differently, encourage them to get crazy and creative and come up with the most amusing pairs! This free and printable 2nd grade worksheet will help your kids improve their readingand writing skills too. Also check out more of our 2nd grade English worksheets.